Did you know your digestive system rules? Yes, your GI tract is one of the most important parts of your physiology. Its very important job is to break down food so the nutrients can build your body systems and tissue. If you don't take in good nutrients and herbs for digestive health, you're likely to develop health problems at some point in time. 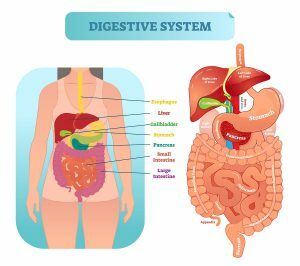 According to Ayurveda, healing starts in the digestive system, the problem is that people do not digest efficiently which weakens the systems and opens the door for chronic degenerative, and non-specific diseases to develop. These can evolve into serious specific diseases, which attacks your health and well-being. When we don't digest well, we call that ‘indigestion'. The wonderful thing about herbs for digestive health is that they are rooted in nature. They help to improve your digestion, but they work in a very gentle manner. 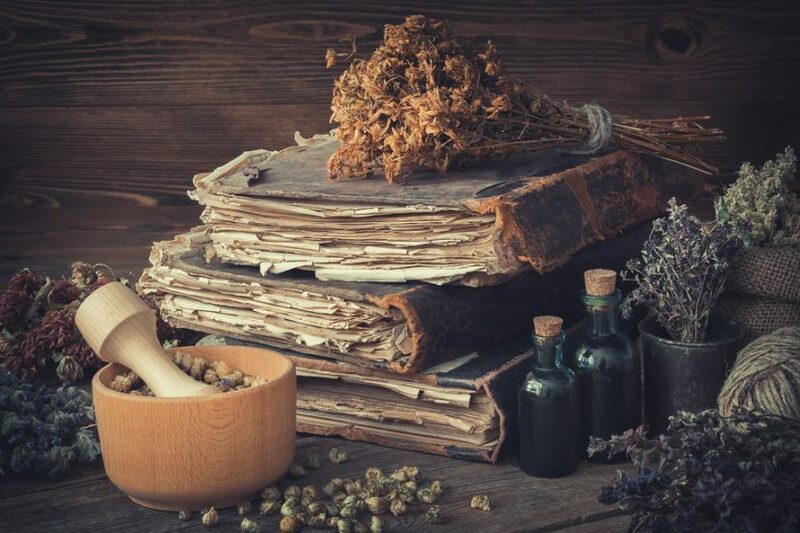 Ancient cultures have been using herbs to tone up the digestive tract for hundreds of years. In those days every home had a medicinal herb garden. The mother of the house always held the knowledge of which herb to give. She knew what worked best to improve appetite, which one would relieve gas, a sour stomach or nausea. 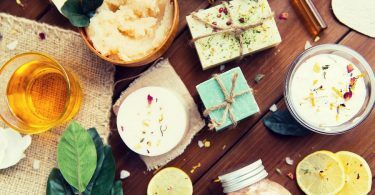 These natural remedies are still alive today and thankfully are regaining popularity. When most people think of herbs, they think about flavor. They don't realize their original purpose was for healing. When our ancient ancestors started to eat more meat and rich, heavy foods, they found they were getting sick more often. But they knew certain herbs prevented indigestion. For example, they knew if they added mint to peas, it would help correct the tendency of peas to produce gas. The tradition of serving mint sauce with lamb is not just for taste either. Young meat is more difficult to digest and the mint helps to prevent it from disagreeing with your digestion. These 7 herbs have a very important and unique purpose in digestion and detoxification of the body. Ginger holds an honorary place in plant-based medicine. It goes all the way back to the Roman Empire, but the Chinese and Greeks used it as a top aid for digestion. 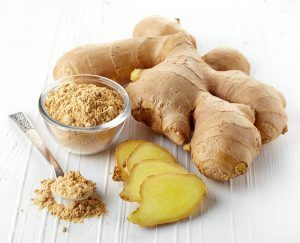 Considered as the “universal medicine“, ginger is perhaps one of the best-known spices because of anti-inflammatory ingredients in ginger named gingerol and zingerones. These components make it the natural remedy when anyone is suffering from symptoms in the digestive system. Confucius, before he ate anything, would sprinkle ginger over his meals. He believed it would promote appetite and help to expel gas from the intestinal tract and stomach. Bring one cup of water to a boil, adding one teaspoon of the parched rice and a small piece of ginger root. Boil for 1 minute, then turn off and let stand for 5 minutes. 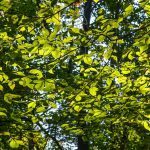 Slippery Elm is one of nature's finest demulcents, which means it helps to neutralize stomach acid and absorb foul gases. It does this by restoring the mucous membranes of the stomach. It has other abilities too. It aids in the digestion of milk by separating the casein particles. It is considered to benefit children and the aged who have delicate constitutions and digestion. Because Slippery Elm is gelatinous, it helps the process of assimilation and elimination. It acts as a protector against irritations and inflammation of the mucous membranes. You can take it for diarrhea, constipation, irritable bowel syndrome, GERD, and for expelling tapeworms. But Slippery Elm is heavy and it can sometimes promote congestion. So, it is often combined with small amounts of spices like ginger, cloves, or cinnamon to support digestion. Of all the mints, peppermint is the most stimulating and the best one to improve digestion. It is highly comforting and agreeable to the stomach. You can use it to relieve gas, flatulence, and stomach acid. Because it is caffeine-free, this beverage won’t cause any restlessness and keep you awake at night. 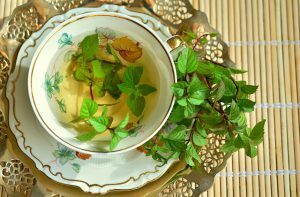 A wholesome tea, aromatic and refreshing, Peppermint can be used by each member of the family. For young children, just one or two tablespoons of this tea, sweetened with honey is ideal for stomach-ache. It can help adults with digestion relief and relieving colicky diarrhea. Studies reveal that using peppermint oil is a treatment accepted to treat IBS because the oil helps in easing bloating, spasms and cramps. The story goes that Angelica got its name during the Middle Ages when a devout man dreamed that archangel Michael appeared and told him the plant was a cure for the dreaded Black Plague. In more present-day descriptions of those times, you can find references to the belief that anyone who kept a piece of angelica root in his mouth all day would be immune from contagious diseases. But most importantly, the seeds and roots are used as a tea to relieve gas pains. Angelica has always been a well-liked flavoring agent in the kitchen and a medicine for indigestion. In some cultures, the leaves prepared and eaten like spinach. 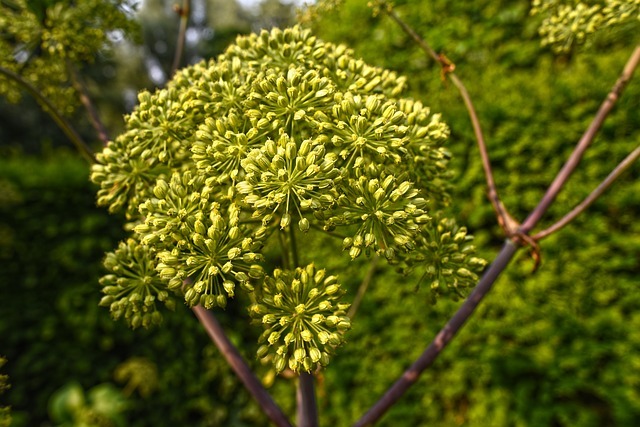 Dr. Vogel of Switzerland insisted the fresh plant extract of angelica had an exceptional effect on digestion. For instance, on irritations of the gastric mucous membrane; on the loss of appetite, and also on stomach cramps. Dr. Vogel was the one who provided this authentic digestive liqueur recipe below. He guaranteed there was no better or more pleasant remedy for digestive trouble or flatulence than angelica. When guests arrived at the ancient monasteries, they were given a glass of “Vespetro”, which had a potent result on their ability to digest. Known as “the friend of the stomach”, fennel is known to help with belching and flatulence. Like Slippery Elm it has a soothing effect on the mucous membranes of the stomach. The seeds were also used to help with aching pain that using a laxative or purgatives brought about. In Italy, the use of the dwarf varieties of fennel called finocchio dates back to the days of the early Romans. Gladiators mixed the fennel with their food, claiming that it gave them strength. 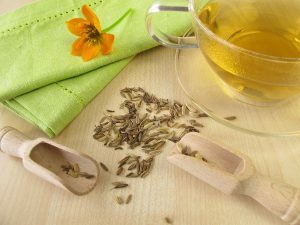 Today, fennel teas are available that help as an aid for digestion, especially after eating any oily or greasy food. 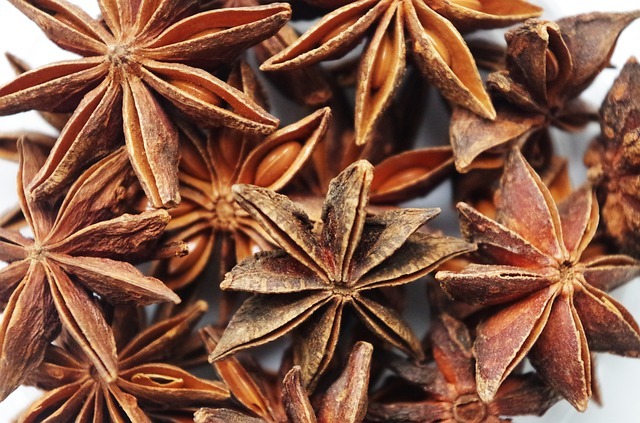 Anise has an ancient status as an herb that promotes the appetite and relives gas. You can chew the seeds to sweeten your breath and stimulate your appetite. Hundreds of years ago, the Romans and Greeks used it in wines, relishes, seasoning mixes and sauces just like we do today. The Romans served their guest's wedding cake flavored with anise seeds. This would help to prevent indigestion caused by over-indulging at the marriage feast. From this ancient ritual came the tradition of baking anise cakes for weddings. An early herbalist, John Gerard, recommended as a remedy for preventing gas and fermentation in the stomach and bowels. The custom of using bitter herbs as a stomach tonic is age-old. Notorious for their overindulgences, Romans believed bitters were necessary with food. The Indians also appreciated the natural bitters of herbs, vegetables, and fruits. Today, bitters are still highly valued by many experts. 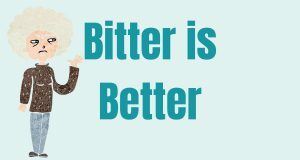 Dr. Douillard always says, “bitter is better”. He writes that we only have one type of receptor for the sweet, sour, salty and savory tastes, but we have 25 types of taste receptors for bitter! 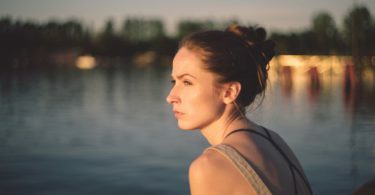 This is because bitter taste seems to activate the immune system, protecting us from infection. He also writes, “The ability for the bitter taste receptors to trigger an immune response is so powerful that many researchers believe that biter-tasting medicines may someday replace antibiotics”. In Iceland and Greenland, bread, and beverages are made of bitter Iceland moss. Bitter herbs are also added to wines, liquors, and beer. In other nations, some people gather the bitter leaves of the wild dandelion early in the spring and use them in salads. Among the Germans, gentian is another highly prized bitter herb. It is known to be a powerful tonic which strengthens the digestion system and improves the appetite to a remarkable degree. Gentian is also excellent for stomach cramps. Father Kneipp, the renowned herbalist used to say that when people in his day, after a long and tedious journey, and after eating much food and drinking, would buy a tiny bottle of gentian tincture to soothe their stomachs. Golden Seal (Hydrastis Canadensis) is another highly regarded bitter herb by the Cherokee Indians for digestive complaints. Medical professionals also took great interest in this herb and many reported on its use in medical writings. Golden Seal is known to relieve heartburn and nausea. Dr. Finley Ellingwood, famed herbalist, wrote that Golden Seal’s primary action is to relieve heaviness in the stomach after eating.